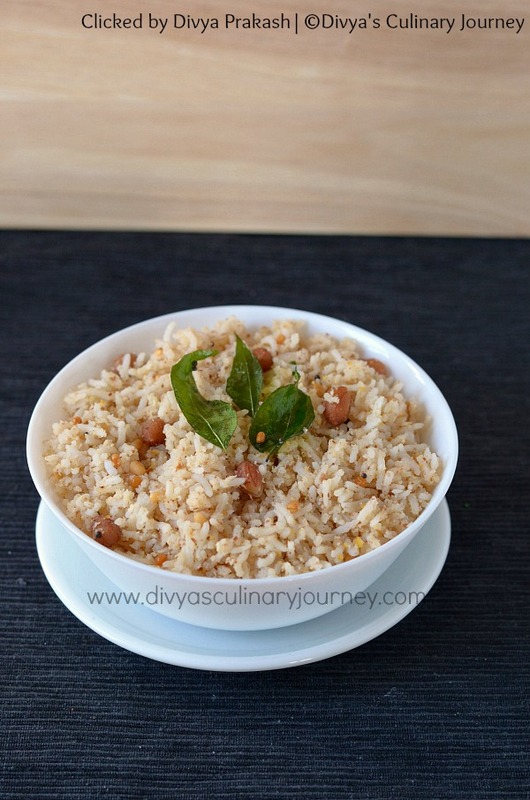 This Peanut rice is prepared in South Indian style. It is easy to make and can be prepared in a jiffy. Dried Red Chillies : 3 - 4 nos. Dry roast peanuts till it is slightly brown and the raw smell is gone. If you have already roasted peanuts, skip this process. In a pan, add a teaspoon of oil, then add channa dal, urad dal and fry for a minute, then add red chillies and sesame seeds and fry for for another minute. Then add grated coconut, mix well and slightly roast it till there is no moisture in the coconut and turn off the heat. Let it cool completely. Then add this to a blender and grind into a coarse powder. Then add the roasted peanuts and pulse it. It has to be a coarse powder. The spice mix is ready. Heat oil in a pan, add mustard seeds, when they sputter, add urad dal, peanuts and curry leaves and fry for couple of minutes. The tempering is ready. Turn off the heat. To this add the cooked rice and spice mix along with required salt and mix well.Peanut rice is ready. The preferred oil for cooking this rice is sesame oil (gingelly oil). Though you can use other oils like sunflower oil, canola oil, vegetable oil, this rice tastes best with sesame oil. Adding peanuts to tempering is optional. Adjust quantity of spice mix added to the rice as per your taste. While mixing spice mix with rice, if needed you can add couple of teaspoons of sesame oil for more flavour. 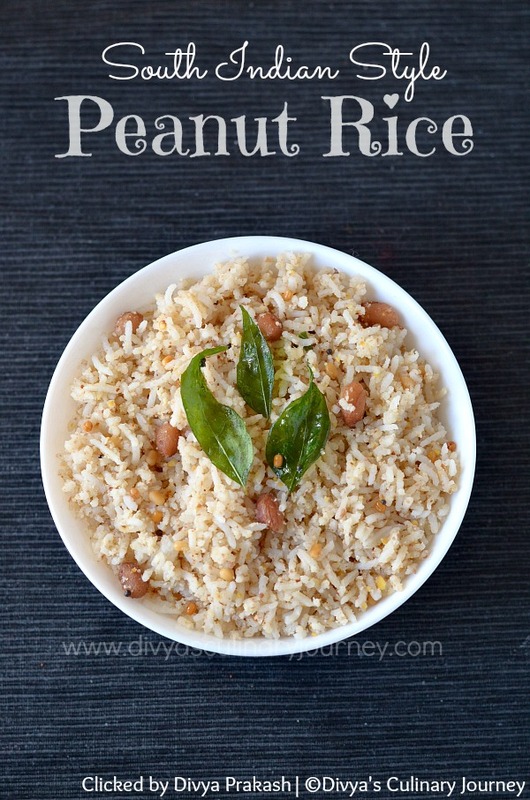 I love peanuts in any form...This is one of my favorite rice dishes..I liked your way of preparing it..
Hi Divya, interesting recipe. Have one query though.... for the spice mix,is the grated coconut also roasted or should it be added after the gas us switched off?